A judge has praised Durham Constabulary firearms officers for showing ‘commendable conduct and selfless courage’ when they shot a man who was brandishing a firearm. Sam Houlihan was carrying a replica weapon when he was shot by firearms officers on the morning of Friday May 25 last year in Bishop Auckland. 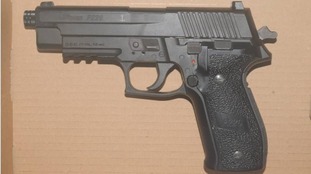 The 24-year-old, from the town, admitted possessing a firearm with intent to cause fear of violence and possessing a firearm when prohibited. He appeared at Durham Crown Court via videolink where he was sentenced to an indefinite hospital order under the Mental Health Act. Later that morning he got a taxi to Cockton Hill working men's club where he was caught on CCTV inside the building carrying the weapon. During sentencing, Judge Christopher Prince said the officers involved should be commended for their conduct during the incident, who dealt with the situation before they were able to get their full protective gear on. "They were very professional, they were calm and they were composed. "I am reassured, and I am sure other people will be reassured to know that Durham Constabulary employ such professional officers who will readily respond to a production of a firearm or any other weapon quickly and calmly." Detective Chief Superintendent Adrian Green, from Durham Constabulary, said: "Today’s sentence reflects the seriousness of the incident involving Houlihan. "It is still unclear what Houlihan’s intentions were, but his possession of a firearm in a public place was reckless and frightening to the public and attending police officers. "While incidents of this nature are rare, it demonstrates clearly the dangers of possessing firearms and replica firearms in public. It also shows Durham Constabulary’s ability and commitment to deal with these types of incidents and keep our communities safe."